About Us – Water Ski Shows Inc. 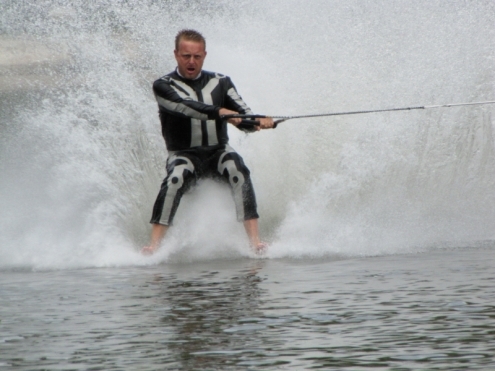 In the beginning, 1978, our company’s interest was specializing in the production and management of water ski shows, thus was born the name Water Ski Shows, Inc.
Thirty-four years later, we find ourselves still in the business or producing water ski shows. However, along the way we added much more to our entertainment portfolio. Our primary purpose is producing/operating live action shows for major theme parks. Water Ski Shows Inc. has performed on every continent in the World with the exception of Antarctica! We are currently producing and operating shows in major theme parks throughout the US and worldwide. It is the policy of Water Ski Shows, Inc. that accident prevention shall be considered of primary importance in all phases of operation and administration. WSSI will implement and maintain all safety policies and procedures that have been established. The prevention of accidents is an objective that affects all levels of this operation. It is basic, yet mandatory that each Supervisors makes “safety of the employees and guests” a part of his or her regular daily management duties. In return, each employee will accept and follow all established safety rules and procedures. The first day on the job, a Safety Orientation is conducted for all new employees. The following are special courses and training that cover specific areas of safety, i.e., boat and water vehicle driving and operating procedures including “approved” show patterns, water skiing disciplines, water rescue, CPR, and firearms training. An Incident Prevention Program has been implemented and utilized in all shows. All incidents are thoroughly investigated. To insure the absolute highest levels of show quality, we maintain strict Show procedures adapted to fit each show site. After each show has been performed, the Company Managers and show leads complete evaluations of performances and maintain daily show logs, which are forwarded to the corporate office and reviewed weekly. To promote the highest standards of performance from our employees, we have created an incentive program that has been implemented through a performance evaluation that monetarily rewards each performer who maintains an outstanding level of show quality. In addition to operating stunt shows, WSSI also produced several water ski shows to include: live action stunts, Special Effects and pyrotechnics, i.e., Rappels from stadium roof, slide for life, high falls, action fight sense, flame units and jumps through fire, jet skiers on fire, water cannons, concussion pyro, mortar hits, and line rockets. As a result of these enhancements to the shows, a higher level of audience appreciation and a strong contribution to the marketing/sales campaigns has increased park attendance. These stunt shows command top ratings in each of these parks! Again, WSSI remains committed to innovation and the highest standards of live show performance. In 2001, “Lethal Weapon” enjoyed its 6th consecutive season with WSSI. WSSI was contracted by Walibi Flevo (WF) in the Netherlands to produce, staff, manage, and operate a water ski/stunt show. After one season of successful shows at WF, 1997 brought another contract to produce, manage and operate “Back To The 50’s,” a story driven water stunt show which included extensive stage work, i.e., 3 dance numbers, 2 fight scenes and 3 songs performed live. The lead character “Pinky” is a female vocalist and is supported by a strong cast of characters. This show received such high ratings, we were asked to reinstall the show for the 1998 season. In addition to “Back To The 50’s,” WSSI was contracted to reinstall, manage, and operate King Solomon’s Mines Stunt Show. We also produce, manage and operate a Children’s Show in a Street Entertainment Concept. WSSI produced “Back To The 50’s” in Mulwala, Australia. This was a five-week engagement. The show was sold as a marketing vehicle to promote business at the Mulwala Casino and Restaurant. Celebrated 15-Year Anniversary at Holiday Park. A special presentation show included a 45-foot jump from a helicopter, to a barefoot ride with a finish on stage. WSSI produced and installed an exciting new water ski show with stunts and SFX in Holiday Park, Germany. It featured choreographed stage work including multiple fight scenes and rappels from the stadium roof, a slide for life, and high fall with pyro hits from a tower, resulting in a dramatic increase in show ratings! The addition of The New Marine World, Ski Show to the line up was very exciting that year. We produced a very fast paced, efficient, and productive show that replaced their “in-house” production. The show was delivered to the park on time and installed completely turnkey. This show provided The New Marine World Theme Park with a stronger entertainment value at a lower cost. Water Ski Shows, Inc. continued to add to their portfolio, installing and operating The Batman Water Thrill Spectacular, located at Six Flags Marine World in Vallejo, CA. Along with this water stunt spectacular, a new land-based stunt show was introduced. The Jungle Theatre Show was produced, installed and operated by WSSI in the new Six Flags Marine World Park. Elitch Gardens, CO decided to add to their “live action” entertainment package by contracting Water Ski Shows, Inc. to install and operate The Batman Forever Stunt Show, another land-based stunt spectacular. USH developed another major live action stunt show and asked WSSI to install and operate it. Terminator 2:3D, T2:3D. This live action stunt show thrills audiences from around the world and is the #1 rated show in the Park. In two of the newest Six Flags Parks, Six Flags Darien Lake and Six Flags New England, WSSI added two more land-based stunt shows, The Batman Spectaculars. Each received high ratings and are very successful shows. Hopi Hari, Brazil’s largest them park contracted WSSI to install and operate Brazil’s first ever professional water ski show. The show created a media frenzy resulting in a home run for the marketing department. Six Flags Marine World contracted WSSI to produce, install and operate a “Dive Show.” It is a fun-filled Pirate adventure titled Captain Cannonball, a high diving spectacular. In 2002 WSSI produced, installed and operated an all new high adrenaline Ski-X-Treme Show at Six Flags Great Adventure and Six Flags Marine World. Water skiing professionals from around the world thrilled audiences with high flying “Extreme” water skiing. The competition element turned perfectly respectable spectators into screaming kids. The popularity of extreme sports proved to be a great marketing tool for both parks, transitioning the spirit of competition with the spirit of Americans, set in a patriotic theme. Six Flags Marine World also contracted WSSI to produce and operate a featured “live action” Fright Fest Show. This gory yet satirical horror comedy stunt show titled “The Reckoning” created wild “over the top” excitement for those who dared to watch. WSSI was contracted by Nashville Shores to present a high impact water stunt show as an effective marketing tool for attracting attendance to the water park. The show was well marketed and created a great deal of excitement which resulted in a significant increase in attendance at Nashville Shores. -Halloween events, Fright Fest, Slaughter World, Bill and Ted’s, Sliders, shows for USH and Magic Mountain. WSSI was contracted by Merlin Entertainment to present a water ski show in LEGOLAND Florida. It is a Lego branded water ski show, presented 4 times a day. It is a very unique show with a target audience of young kids, who really enjoy the show so much! This show features skiing Lego characters along with spectacular water skiing, jet skiing, boat action, IE jumping, bare footing, wake boarding, hydro foiling, swivel skiing, and much more. WSSI provides and manages all the talent for the show. Holiday Park / WSSI presents “Hollywood Spectacular” a live action water ski / stunt show. Hollywood comes alive at Holiday Park in Hassloch, Germany with memorable characters and non stop action where audiences learn to expect the unexpected. WSSI continues to staff and manage the very successful Legoland waterski show, “Battle For Brickbeard’s Bounty”. This unique show production continues to evolve and grow as it earns top ratings at the park. 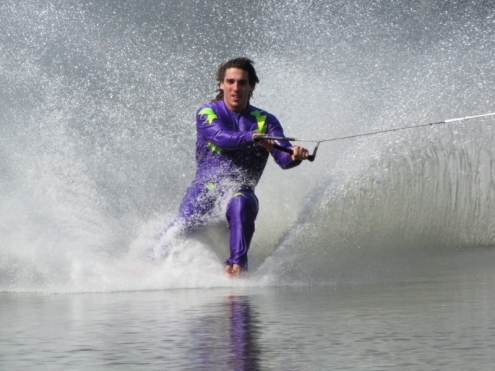 Holiday Park / WSSI presents “Talking Dead” a live action water ski / stunt show. Zombies are a big hit in Germany at Holiday Park! Zombies fight for their rights in this unique (live and dead) production providing great action scenes featuring extensive special effects, make up and costuming. Holiday Park is celebrating it’s 45th anniversary, and WSSI is producing a (celebration show) honoring this important milestone. Congratulations Holiday Park, let the fun begin!